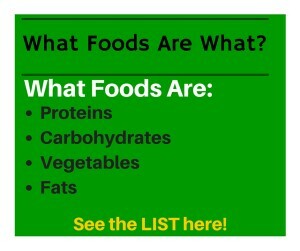 So much fuss about what to eat and what not to eat. So many “diets” people try to do in an attempt to LOSE WEIGHT. Truthfully, I think that if people actually had the correct FACTS, if they tried to understand food, their bodies and just tried to be more moderate instead of always looking for a new DIET, they would actually get way better results. I have a group of ladies that are in a Private Facebook Group doing one of my programs with my coaching. I realized through this group and their questions that there are so many basic things that people don’t know like for example the fact that FRUIT IS A CARB and NUTS ARE NOT A PROTEIN. So many people have no idea what foods are under what category so half the time people are making choices they think are good and right but they are not. 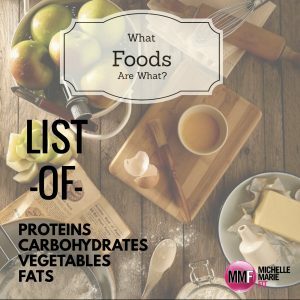 So I made a list of all the PROTEINS, CARBS, VEGGIES AND FATS. I may have missed a few, but this will give you a much better idea. You may want to print out this list and keep it in your kitchen. Now if you want to speed your metabolism so that you can BURN CALORIES ALL DAY LONG, you have to eat often. You eat a small meal every 3-4 hours and include a PROTEIN, CARB AND VEGGIE. In 2 of those meals add a FAT. If you do this, consistently, I promise you, YOU WILL LOSE WEIGHT. If you are not sure what to eat and you are bored of the same meals. Why don’t you take my 14 Day CLEAN EATING CHALLENGE? All you have to do is follow the MMF Weeknight Meals E-Book for 14 days. In it, you will find amazingly EASY, DELICIOUS and SUPER HEALTHY meals to make for dinners. And I will give you a list of HEALTHY, EASY and YUMMY BREAKFAST & SNACK IDEAS. You will be blown away by the results and by how yummy all the meals are and by how full and satisfied you will feel. I want to show you that you don’t have to eat bland and boring and feel hungry all day in order to see weight loss and results. Here is a CLEAN EATING GROCERY LIST. I made it to make your life easier when it comes to cooking and eating healthy meals for you and your family. It’s really all you will ever need to eat healthy and you can just print a bunch of them out and use them weekly. Hope this helps you to eat cleaner so you can see better results. Which ones of the foods here in this list did you have wrong? Like, what did you think was a protein but is really something else?